Making connections helps students remember information, but teaches them to not pay attention. Nothing can derail a lesson faster than students sharing their connections. Following our trains of thought is what makes inattention. I unknowingly encouraged my students to distract themselves when I asked them to make connections. Even when I figured out that they took away precious time from our lesson, I never taught them to manage those associations. Teaching children to manage these connections is a crucial step in teaching children how to pay attention. Charlotte Mason used the phrase, “a good servant, but a bad master” several times in her works. These associations do serve purpose. They aid in helping children remember content, and move it to long-term memory so that it isn’t quickly forgotten. As soon as associations take over, though, the child’s ability to attend is in trouble. When these thoughts become the master, they lead the child away from what is important, and down a winding path that leads to a dead end. Like I’ve written about before, we have to teach children how to pay attention. We teach them that when their thoughts start to wonder, they need to redirect them to the task or information at hand. This is not just because it wastes time in a lesson. Redirecting our thoughts is an important habit to use throughout life. It is helps us with social skills, work productivity, and the ability to continually learn. We all know adults who have this “desultory habit of mind.” It drives me crazy trying to talk to someone who gets so caught up in tangents that I’m not sure what we’re actually talking about. I can’t judge, though, because even though I can keep a conversation on track, my focus has been all over the place since sitting down to write this post. I’ve checked my email, browsed on Instagram, and cleaned a cluttered room in the last hour. When I started teaching at an Ambleside School, I learned the art of direct instruction regarding habits of attention. I asked the students to imagine that their thoughts were walking away, and that they needed to reach out and grab them. This gave them the idea that they were in control of their thoughts, and that they needed to make a distinct effort to stay focused. This is a habit that needs modeling. I guess I can add this to the list of habits I need to improve on in the New Year! (That’s my word of the year- read more here if you want to- or you can just stay focused 🙂 Redirecting my thoughts out loud can help show my children how to dismiss those associations and focus on the task or idea. Now that I’m aware that these connections tend to pull our attention away, I’ve worked on redirecting my daughter when she shares her connections. The fact that she’s making them can help her, but teaching her how to manage them is key. Thank you for this post! I teach a child with HF/ASD and “tangents” and lesson “hijacking” are a way of life! 😀 Looking forward to implementing some of your suggestions. Oh yes, I can relate to those things! I hope my suggestions help! 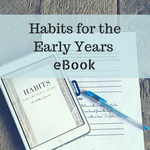 Thanks for writing this it has been a help to a old homeschool mum. You make a good point about connections and not following the rabbit trails are children can take us on. Very insightful. I’m so glad it has been helpful, Michelle! Thank you for visiting!